Pakistan Navy has inducted its 1st Marinized/ Upgraded ATR aircraft and Sea king Helicopters (Ex Mod UK) in its fleet to augment effectiveness and enhance its operational capability. An impressive induction ceremony was held at PNS MEHRAN. Chief of the Naval Staff, Admiral Zafar Mahmood Abbassi graced the ceremony as Chief Guest. 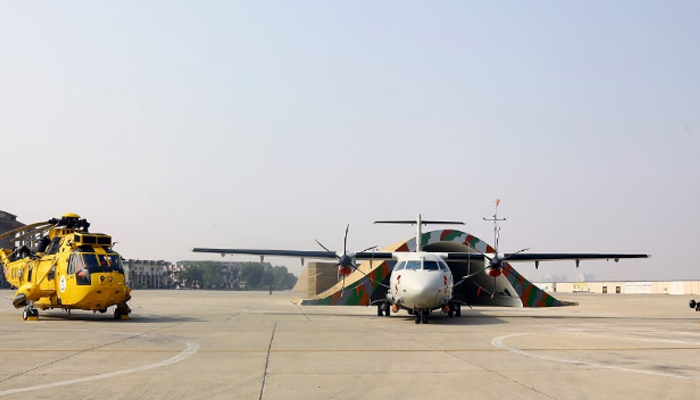 The 1st marinized ATR aircraft; a modern and widely operated turboprop platform, has been retrofitted with state of the art weapons and sensors, which will substantially enhance Fleet Air Arm's operational capability commensurate with contemporary Maritime Warfare requirements. Whereas, induction of two Mk 3A/ Mk 4 Sea king helicopters acquired from UK into its existing fleet of Sea King helicopters will further enhance PN fleet operational capability particularly to troops transfer. One helicopter is purpose built for Search & Rescue missions at sea and other aircraft is optimized for the troops-carrying role. In order to ensure quality training of aircrew, Pakistan Navy today has also inducted a state of the art Simulator of Z9EC Anti- Submarine Warfare helicopter to train its aircrew. This simulator will enable aircrew to acquire training for anti- submarine and emergency handling in a cost effective manner without endangering life and equipment. Speaking on the occasion, Chief of the Naval Staff said that, in addition to traditional roles, Pakistan Navy is also confronted with emerging challenges of deterring terrorism at sea, curbing piracy in the region and carrying out maritime security operations. The Admiral emphasized that we should also be cognizant of threats posed by hybrid warfare and cyber crime. “Pakistan Navy is aware of these challenges and induction of these modern platforms will augment PN operational capabilities manifold to more effectively face these challenges, achieve national objectives, honor international obligations and safeguard our vital maritime interests”, he said. He added that wars are fought not only on material aspect but spiritual strength also matters a lot. Pakistan Navy though inferior in number has inflicted irreparable loss to the adversary in past and this happened because of the spiritual strength and professionalism of our men. He said that induction of training simulator will provide us great capability to train our aircrew with full degree of freedom to achieve unflinching and highest standard of professionalism. The ceremony was attended by Pakistan Navy Flag officers, officers and civilian dignitaries.